You may be studying microbiology at a university. You may be working a desk job in sales. You may be interning at a PR firm. But back in high school, lest no one forget, you were a star. To be precise, a star of the choral variety. Yes, the voice was your instrument and you played that thing all day long. Latin hymns, Broadway musical hits, Robert Frost poems set to a beat - no song was too complex (or out of your range) for your limber vocal nodules. While lesser high schoolers were playing football, partying or studying til the wee hours, you were poring over that precious black folder, figuring out what in the world an arpeggio was. You may have graduated but you've never moved on. The real choir kids never do. 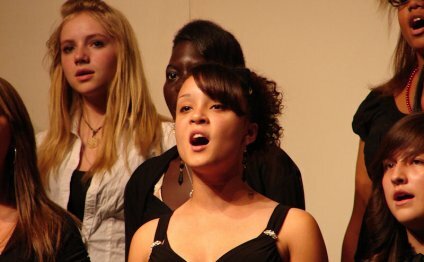 Behold, 24 signs you were a high school choir geek. 1. You know one vocal range reigns above all other vocal ranges. They call it Soprano 1 for a reason. 2. You were suspicious of anyone who offers you dairy products the day of a performance. "You mean you don't want that scrumptious looking milkshake?" 3. You research a karaoke joint before going to make sure they have your song. If they don't have Mariah, they don't have your business. 4. You know how to work a one-size-fits-all, floor-length black dress. A couple safety pins never hurt anybody. 5. Your car was a portable auditorium of sorts. Whoever's riding shotgun better know how to harmonize. 6. Vocal warmups still haunt your dreams. Zee-ee-ee-aah-ah-ah-ah-ah-ah-ah-ah-ah-ah-ah-ahhhhh. 7. You're not exactly sure what your soft palate is. But you know it should be lifted. 8. You always breathe from your diaphragm. It's not just a method of birth control. 9. You have a very particular type. Tall, dark, and good beat boxer. 10. Nobody touch your choir folder. Seriously, has anyone seen my choir folder? 11. You seriously considered naming your son Staccato. It has a nice ring to it, no? 12. There's no family like your choir family. Unless there's a solo and then it. is. war. 13. You may or may not have secretly tried out for American Idol just to see what happened. Just try and prove it. 14. You know a weirdly wide range of famous poems, Latin hymns and African chants. What can I say? I'm a scholar. 15. Your choir teacher somehow knows all your secrets. And may have seen you cry on more than one occasion. 17. You felt a sharp pain in your gut whenever a new teen pop star emerged on the scene. So young, so unworthy. 18. Other people love Beyonce. But you get Beyonce. 19. Shower time was homework time. And let's just say you did extra credit. 20. Your LBD was a long black dress. So long. 21. You have a soft spot for light choreography. Ain't nothing wrong with a gentle sway. 22. You don't really get the obsession with "Center Stage." "Pitch Perfect" speaks to you.